A common injury to the neck following an auto accident, whiplash can result from a fender bender or a head-on collision. 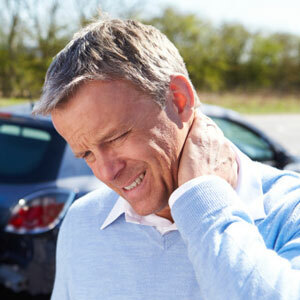 If left untreated, whiplash can be highly debilitating with far-reaching effects. At Twins Chiropractic and Physical Medicine, we always advise you to get your spine checked following any kind of auto accident, even if it’s seemingly minor. Why? Because any body part that’s jolted or propelled forward unexpectedly can sustain microscopic stretching and tearing of ligaments. The ones that support the head and neck are particularly vulnerable. Since chiropractors specialize in ensuring that the nervous system is healthy and free from interference, it makes sense to get a comprehensive evaluation following a collision. Our years of experience tell us that spinal devastation can occur following a whiplash injury that’s left untreated. Though spinal trauma always triggers initial pain, that same pain eventually fades. The effects of the accident, however, remain. The result is intermittent pain, stiffness and loss of mobility, primarily due to vertebrae that have deteriorated. The main goal that we have for you while you’re under our care is to prevent spinal degeneration from occurring in the future. While providing pain relief and decreasing inflammation isn’t difficult after an injury, the challenge is preventing future degeneration and the potential consequences of a chronic condition. Because we want you to regain full function, completing an entire treatment plan is essential for maximum spinal correction. We’ll relieve your pain as quickly as possible, and recommend a comprehensive treatment plan to not only realign your spine, but foster the healing and regeneration of all supportive tissue. Your case will be managed in a professional manner with all required documentation. We use thorough diagnostic evaluation methods, including state-of-the-art digital X-rays, image scanners to measure inflammation levels in the spine, and MRI options. To ensure you get comprehensive care, we are closely affiliated with professional orthopedic and pain-management specialists. We’ll present you with an extensive list of attorneys that are well-versed in personal injury. Most of the attorneys we work with are trial based and can provide their clients with personal attention. We also accept all personal injury cases on a lien basis, which allows our patients to get the care they need without any out-of-pocket expense. Our office does not receive reimbursement until care is concluded, which is when the case is settled. If you’ve been injured in an accident, contact us right away. We want to get you out of pain and on the path to recovery!